Photo by Rolf Hicker: Travel Stock Photography. 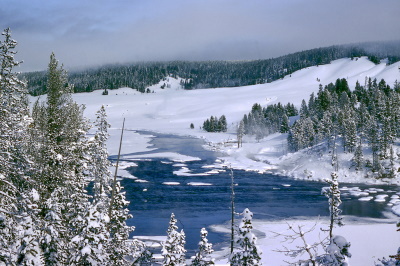 Yellowstone National Park is located in the seismically most active area of the Rocky Mountains and shows globally unparalleled surficial geothermal activity. This leads to the existence of 200 species of petrified plants and features like geysers (with 200-250 in number, more than all of the rest of the world combined), hot springs, mud pots and fumaroles. Furthermore, the park is the habitat of a great number of grizzly bears. The diversity in animal life is fantastic. Head to the Lamar and/or Hayden Valley to see herds of bison and pronghorn. Twice we experienced a bison bull walking right beside our car. It's mating season so the bulls are on a mission and it's not uncommon to see them walking on the roads. We also saw a wolf at Lamar Valley, much to our delight! Near Mount Washburn, we spotted our only grizzly bear. Our biggest mistake was not bringing any binoculars on this trip. A very kind couple had a telescope set up on a tripod on the side of the road and allowed our family to take turns to see the bear. This was a highlight for our kids. Other animals we saw were moose and trumpeter swans. Other areas of beauty include the Norris Geyser Basin, the Grand Canyon of Yellowstone, and my children's favorite, the Artists' Paintpots. Seeing Old Faithful erupt right at 4:26 pm was also a thrill for us. We stopped at Fairy Falls to hike to see the Grand Prismatic Spring, the rainbow colored hot spring that is so ubiquitously photographed at the park. While it was a nice jaunt, the spring is not really visible and there was no overlook to take a proper aerial view picture. We probably should have parked closer to the Midway Geyer Basin to get a closer look. If you have time, pay the extra money when you enter the park to also visit Grand Teton National Park. Although it's not a WHS, it's beautiful in its own right and the mountains are spectacular. We did spend most of our time at Yellowstone and since we only planned for a week, we were on the go a lot. if you prefer taking it easy, you should budget for more time. It really is a huge park with so much to see and do! I went in 2011/12 during mid-winter. It was cold, and I thoroughly enjoyed it. The Inn was closed, due to a lack of heating, but it was beautiful to play in the deep snow banks. We sat for hours watching the geysers, and made snowmen. The information center is interesting with Bison pelts and casts of the size of Wolf feet. it truly is beautiful. We went cross country skiing, and saw many Elk, Coyotes, and Bison. I am in love with this place and will definitely visit again. I planned to make a road trip in US for quite a while, after a lot of information gathering, my travel teammates decided to go to Rocky Mountains and one of our prime destination was Yellowstone National Park. After many breathtaking views along the way from Utah, like Logan Pass, Bear Lake and Grand Teton National Park, we finally reached Yellowstone almost twilight. The first place we decided to stop was the Duck Lake to enjoy the view of last sunlight on the lake surface, and then we continued to the historic Old Faithful Inn which we booked for three nights. The inn's seven stories lobby was an incredible sight with sophisticating design of countless wooden beams. The next day we saw the famous Old Faithful geyser. The geyser was definitely one of the highlight for me, sadly that my friends already went to Iceland and New Zealand and saw the more impressive one and found Old Faithful quite tamed, not surprised that the comparison with Iceland or New Zealand were always happened in this trip! Then we saw many hot spring pools and numerous small geysers, many pools had beautiful colors made by bacteria so it was a brilliant day for photo; the granddaddy of all pools was the Grand Prismatic Pool, this large one had many beautiful colors almost like rainbow, and its bacteria cascades was very interesting to see. The next day we visited the northern part of the park, along the way we encounter a lot of bison, elks, and a fox also many birds. We drove until we entered into Montana to see the Roosevelt Arch which was the main entrance to Yellowstone. Mammoth Hot Spring was our today target as it was looked stunning in the poster; however, we discovered that most of the hot springs was already dried, its empty cascade pools were grayish and dusty, we questioned the poster we saw and found out that the poster we saw was taken in the early 80! Fortunately Mammoth still had a small area that the springs were still run, despite its small size; the cascade was stunning with its cream colors and hundreds of small blue pool. My friend said the name Mammoth was really suited to the place as the place already extinct. Our last day we went to the Grand Canyon of Yellowstone, I was really surprised with the stunning landscape of the canyon especially at the Artist Point, the view of the Lower Fall and the colorful tones of red and yellow in the canyon was truly breathtaking and unbelievable site. We went to every viewpoint but nowhere made me wow like Artist Point. The last place we visited was the large Yellowstone Lake where we had late lunch before continued our trip to Idaho. The vastness of unspoiled landscape in Yellowstone was a great place to visit; the natural phenomenon was beyond imaginable and really showed the greatness of Mother Nature and American World Heritage Site. Actually in my opinion the whole stunning Rocky Mountains can easily be listed as World Heritage Site if only Americans want. Natural World Heritage Sites are not really my specialty; however when one is as impressive as this it really has an effect. This was WHS number 200 for me and I couldn’t have picked a better place to celebrate the milestone. Not only is the park full of a vast array of natural wonders but its designation as arguably the world’s first ‘national park preserved for the good of the citizens and generations to come’ is what has eventually led to this list of UNESCO’s that I spend so much time on. We visited over two, very cold, days in late October. The majority of the parks amenities had closed down, this did limit our eating options a little, but it did mean that there were fewer people in and around the park, and many times it felt like we had the place to ourselves. The only time when there were crowds was for the eruption of Old Faithful, but this was to be expected. The night before our visit we were having dinner at our friend’s home and they stated that the Grand Canyon of the Yellowstone was their distinct highlight of the park. I’m really glad they did, up until then it was something that I only had earmarked as a ‘maybe’ however we made it the basis of our first day in the park and I was exceptionally happy we did. The two waterfalls at its western end were magnificent and being so close to them you could really feel how the power of the water could have created such an impressive canyon. The fact that there was snow swirling around as we looked out from our perch just added to it. By the time we had made it around to Artist’s Point the sun was beaming and really bought out the near sulphurous colours of the rocks. So thank you Tommay and Doris for such a great recommendation, I hope you enjoy the reviews and can excuse the spelling and grammar mistakes! Our second day focused on the geothermal features of the park a little more. The distinct highlight for me was getting enveloped in the steam at the Grand Prismatic Spring, enjoying the brief warmth it gave on a bitingly cold day, and being astonished when there was a brief clearing of fog to see the wonderful array of colours in the water. Our trip to the West Thumb Geyser Basin gave us a great view of the Lake at the heart of the park, as well as letting us get up close to some deer and a massive stag that were attracted by the heat from the pools and seemed to revel in penning in us humans by blocking off the board-walks. The presence of so many animals made the whole park more enjoyable. Previous trips to natural WHS have been distinctly underwhelming in regards to animal sightings, but here without even trying we got great views of many different birds and animals, perhaps most memorable was rounding a corner to find a bison in the road that was probably bigger than our car. After finishing up at West Thumb we headed south out of the park through the magnificent Grand Teton National Park, reminding us that Yellowstone is very much part of the Rocky Mountains. As with Rome and Angkor 2 days of just seeing the highlights left me wanting so much more, that is why I have no problem stating that this is one of the finest World Heritage Sites I have visited. Yellowstone is an amazing park! It is unlike anything else you have ever experienced. that first look at Old Faithful going up sends chills through you. The beauty of the park lies not only in its' geological uniqueness but but its' rolling plains where you can see bison, deer, wolves, bear....The geysers are beautiful both in their silence and their explosions. Looking into some of those blue pools is like looking into eyes. I happened to experience a sunset by the Old Faithful area. It was one of the most amazing experiences. the sky was a dark orange and the smoke of the geysers intertwined with it. 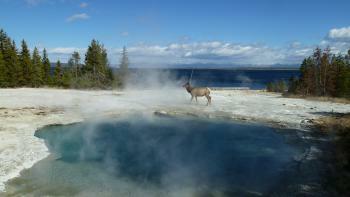 There is so much to do in Yellowstone and a variety of choices on where you can stay. due to its' location; we combined it with a trip to the Tetons. My family has been to Yellowstone twice, camping on both occasions. In addition to the stunning beauty and remarkable geology, it is simply the best place to watch animals in the United States. None of us will ever forget the morning we woke up with a very large bull bison in the campsite next to ours! 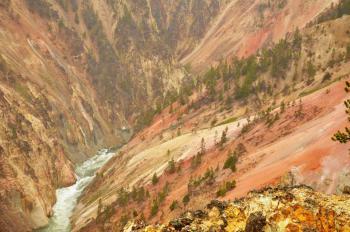 to Yellowstone is people. It gets hordes of tourists. My visit coincided with the devastating forest fires of 1994, but not to worry, this is all part of the cycle. The park is so big that there was plenty of unravaged alpine beauty around. The geothermic activity provided an interesting albeit smelly change in scenery. Plus, wildlife is ever-present, especially the very large, very free-roaming buffalo. Yellow, and emerald color bubbling hot water pools were scary but gushing Old Faithfull is really astonishing.The freely wondering Buffalo and other park animals and evergreen trees brings the nature so close to our hearts. Yellowstone is simply great. Glad I went there. From "Yellowstone" to "Yellowstone National Park"
Recorded natural discoveries: First visit by a non-indigenous person was in 1807 (John Colter). John D Rockefeller Jr: "At Yellowstone, the trailside museums evolved into a system of four buildings, again sponsored by the Laura Spelman Rockefeller Memorial fund. These four museums, opened from 1928 to 1931, interpreted the features found along the park's Grand Loop Road to passing visitors. All four museums employed a distinct style of rustic, natural materials used in a way that promoted an intimacy between the landscape and the structures." Fatal Accidents or 'disasters': "There have been 22 known deaths related to thermal features in Yellowstone since 1890" Plus: Since Yellowstone was established in 1872, eight people have been killed by bears in the park.